114 I WRAPS I 2015 It may be possible to improve adhesion by wiping the wall down with isopropyl alcohol; however, this does not always work. The next option is to step up to a stronger adhesive. This means you will get something that sticks, but not necessarily something that will remove without causing damage to the wallboard. Portable toilets, ATVs, and garbage cans are all examples of low-surface-energy plastics where the film's adhesive should be taken into consideration. Other Complications Garage doors are another example of a wrap application that seems pretty straightforward at first, but can become complicated for a few different reasons. The first thing that comes to mind is the contours on a garage door itself. I've seen some that are fairly simple and would pose no issue to conformability. I've also seen garage doors that are corrugated where it would be easy to heat-stretch the film but then it will likely lift later. Another thing to consider on the garage door is the type of paint that covers it. I've learned that garage doors are mostly powder coated at the factory. I also learned that not all powder coat paints are the same and just because one adhesive works on one door today, that doesn't mean it will work on the one you are asked to wrap tomorrow. Because of this variability, it is important to test the product prior to installation. If the film you want to use does not stick on a small scale, it very likely it is not going to work on a large scale. Test on a Small Scale For the most part, the wraps you encounter on a day-to-day basis will be relatively straightforward. 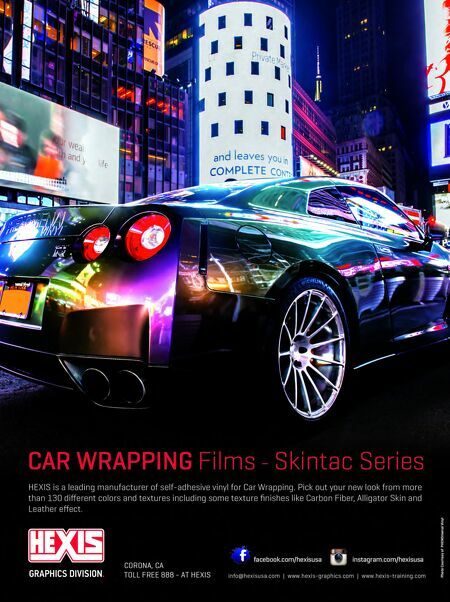 However, if you encounter a wrap opportunity that is not covered in a manufacturer's literature, and you are not sure what film to use, I strongly suggest contacting your media supplier for advice. Check with a couple of different media manufacturers to see what your best options are. Then I highly recommend testing film candidates on a small scale before moving forward on a full-scale job. Taking that extra day to test could save you lots of time and money. T O O l S & e q u i p m e n T Airplanes ATM Machines ATVs / UTVs Bar Tops Baseball Catcher Masks Bicycles Go-Carts Bass Fishing Boats Boathouses Box Trucks Brick Walls Buildings Cabinet Fronts Campers Canadian Electrical Boxes Canadian Post Boxes Cars Car Interiors Caskets Cell Phone Covers Cement Pillars Cinder Block Walls Computers / Laptops Custom Wheels Desks DOC Bands Drums Dumpsters Electric Score Boards Elevator Doors/Interiors File Cabinets Fire Trucks Floors Interior/Exterior Flower Pots Food Trucks Fountain Tops Furniture Gaming Systems (X-Box, Wii) Garage Doors Golf Carts Guitars Gun Stocks Helmets Hockey Goalie Masks Ice Boxes Interior Walls iPad / iPod Covers Kitchen Appliances Laminators MotorCross Bikes Motorcycles Motorcycle Parts Musical Instruments Pianos Porta Potties Portable Ice Machines Printers Prosthetic Devices Refrigerators School Lockers Semi Tractors Semi Trailers Skateboards Skis Ski Dos Slot Machines Snow Boards Snow Mobiles Snowmobile Speaker Housing Steps / Risers Surf Boards Table Tops Toilets Toilet Seats Toilet Stall Doors Tool Boxes Train Exteriors/Interiors Trash Cans Trucks Urns Vending Machines Walls Interior/ Exterior Washers / Dryers Windows Zambonis looking for Wrap Applications? It seems like everyone is wrapping cars, trucks and busses. 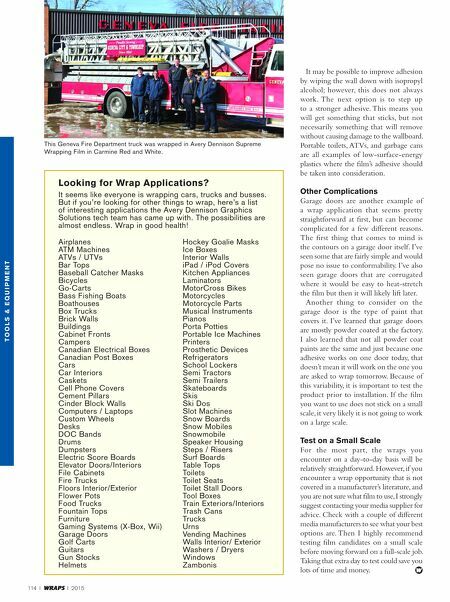 But if you're looking for other things to wrap, here's a list of interesting applications the Avery Dennison Graphics Solutions tech team has came up with. The possibilities are almost endless. Wrap in good health! This Geneva Fire Department truck was wrapped in Avery Dennison Supreme Wrapping Film in Carmine Red and White.